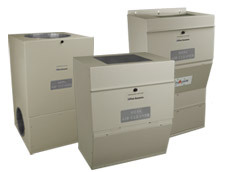 Comfortek Heating and Air Conditioning Inc.
MODELS FSHEPA350, FSHEPA450, FSHEPA650, FSHEPA550-3. HEPA stands for High Efficiency Particulate Arrestance. It is a special type of extended surface, deep-bedded, randomly positioned fibrous material media. The True HEPA Filter was developed during World War II by the Atomic Energy Commission and was designed to remove radioactive dust particles from the air, which might escape and present a health hazard to the researchers. Radioactive dust particles only attract and adhere to HEPA material. True HEPA Filters are regarded as the best form of air filtration. Hospitals, laboratories, even NASA spend thousands and even millions of dollars to create contamination free environments called Clean Rooms to help eliminate foreign particles, infectious agents, heavy metal particles, and a variety of other undesirable contaminants. Are all HEPA Filters the same? For a filter to be called “True HEPA”, it must be “Certified”, in that it can remove a minimum of 99.97% of all particles 0.3 micron and larger, on the first pass of air going through it. The HEPA Filter becomes more efficient as it becomes dirtier with time. Not all HEPA Filters are True HEPA. Hospital Grade, Commercial Grade or High Alpha HEPA filters may be as low as 95% efficient on 0.3 micron and are still considered HEPA. HEPA-Type or HEPA-Like filters are simply impersonators. They are lower cost and not as efficient as a True HEPA Filter. For example, “leather-like” is vinyl. Only leather is leather. Are all Whole-House HEPA Air Cleaners the same? 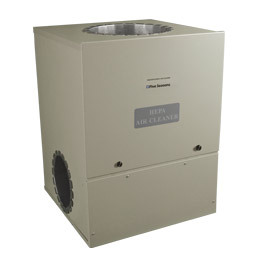 NO, all HEPA Air Cleaners are NOT the same! 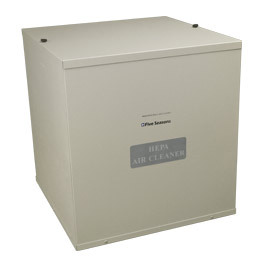 Some HEPA Air Cleaners have True HEPA Filters, but they do not deliver true HEPA status in the clean air stream. There is not a tight seal between the HEPA Filter and the cabinet, thereby allowing air gaps and blow-by. Some popular HEPA brands deliver as low as 85% efficiency, although their packaging and advertising would lead the consumer to believe they are 99.97% efficient. All Five Seasons HEPA Air Cleaners contain Certified True HEPA Filters and are also True HEPA Air Cleaners. 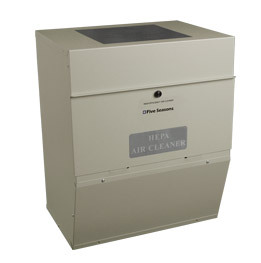 How do HEPA Air Cleaners work? As millions of airborne particulates and gases travel through your heating/cooling system 4-5 times every hour, the HEPA Air Cleaner connects to the return air duct and diverts 1/3 to 1/2 of this dirty air through a 2 or 3-stage filtration system. Your home can reach as many as 67 whole-house air changes/day depending on your house size and model chosen. And when you add a Five Seasons or Electro-Air Electronic or Media Air Cleaner to your return air, your home can achieve 96+ whole-house air changes/day. It’s more effective than any single air cleaning system on the market! 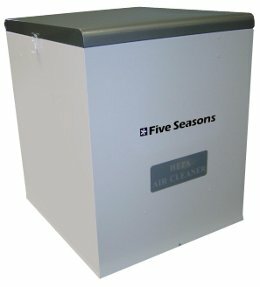 Why purchase a Five Seasons HEPA Air Cleaner? Indoor pollution levels can be 25 times and occasionally 100 times more polluted than outdoor air, according to the EPA. A High Efficiency Media or Electronic Air Cleaner is not enough to filter the millions of pollutants generated and infiltrating our homes daily. A HEPA Air Cleaner combined with an Electronic or Media Air Cleaner will provide much finer air filtration. 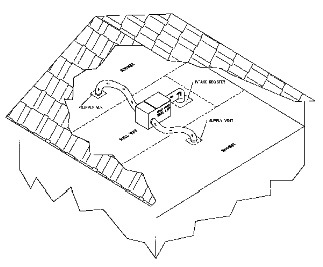 In the event of world disaster such as biological warfare or nuclear fallout, the HEPA Air Cleaners can capture biological contaminants, along with radioactive dust. An ounce of prevention is worth of pound of cure. Allergy, asthma or respiratory sufferers will feel a significant difference in air quality. Housekeeping time will be drastically reduced. New home owners and renovators will be greatly protected from the excessive dust and odors off-gassed from new carpets, construction materials, paints, etc. Households with pets, offensive cooking odors and mustiness will find a noticeable difference in air quality. Ideal for homes 1000 to 1700 ft². Powerful European Motor delivers 245 CFM (416.5 m³/hr) of pure air. Up to 44 air changes per day in a 1000 ft² home. Up to 30 air changes per day in a 1500 ft² home. Up to 22 air changes per day in a 2000 ft² home. Versatile installation can be freestanding, ceiling, wall or floor mounted. Carbon Prefilter Blanket removes lint and odors, to extend life of HEPA filter. Certified True HEPA Filter Cylinder contains 65 ft² (6.04 m²) of material. Plug-in Power Cord for easy electrical connection. Heavy gauge steel cabinet and powder-coat paint finish provide rigid installation and durability. Small footprint for easier, more convenient installation. Measures 18.5 x 18.5 x 19.25 inches. Weighs 38 lbs (17.4 kg). European Variable Speed Motor – Model FSHEPA350VS. Carbon VOC After Filter helps remove odors and gases. Ideal for homes 1500 to 2500 ft². Powerful European Motor delivers 305 CFM (518.5 m³/hr) of pure air. Up to 24 air changes per day in a 2000 ft² home. Up to 18 air changes per day in a 2500 ft² home. Certified True HEPA Filter Cylinder contains 100 ft² (9.29 m²) of material. Measures 16.25 x 17.5 x 20.0 inches. Weighs 43 lbs (19.5 kg). European Variable Speed Motor – Model FSHEPA375VS. Ideal for homes 1700 to 2800 ft². Powerful European Motor delivers 330 CFM (561 m³/hr) of pure air. Up to 40 air changes per day in a 1500 ft² home. Up to 30 air changes per day in a 2000 ft² home. Up to 24 air changes per day in a 2500 ft² home. Measures 18.0 x 18.0 x 24.5 inches. Weighs 51 lbs (23.1 kg). European Variable Speed Motor – Model FSHEPA450VS. Ideal for homes 2800+ ft². Powerful European Motor delivers 560 CFM (952 m³/hr) of pure air. Up to 39 air changes per day in a 2500 ft² home. Up to 33 air changes per day in a 3000 ft² home. Up to 28 air changes per day in a 3500 ft² home. Activated Carbon Prefilter removes lint and odors, to extend life of HEPA filter. Certified True HEPA Filter contains 188 ft² (17.5 m²) of material. Activated Carbon VOC After Filter (standard) 9.5 ft² (0.883 m²) removes additional unpleasant odors and gases. Measures 21.5 x 20.5 x 28.4 inches. Weighs 88 lbs (39.9 kg). European 2-Speed Motor available – Model FSHEPA550-3D. Carbon & Potassium Permanganate VOC After Filter removes noxious odors and gases. The Five Seasons Duct Mount HEPA Air Cleaner is ideal for homes that have tight space conditions in their furnace / air conditioning rooms. This unit is compact and can be installed directly on the return air vent . It can also be mounted directly to the furnace and collar mounted to the return air duct to save space. Millions of airborne particulates and gases travel through the heating/cooling system 4-5 times every hour. 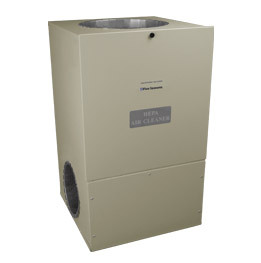 The HEPA Air Cleaner connects to the return air duct and diverts 1/3 to 1/2 of this dirty air through a sealed 3-stage filtration system. A home can reach up to 58 whole-house air changes/day depending on the house size. And when a Five Seasons High Efficiency Electronic or Media Air Cleaner is added to the return air, the home can achieve 96+ whole-house air changes/day (with system fan on continuous). High Efficiency Prefilter removes lint and hair before they enter HEPA filter. Activated Carbon Prefilter removes odors to extend life of HEPA filter. Long-life, 99.97% HEPA Media Filter removes particles 0.3 micron (1/84,000 of an inch) and larger on the first pass of air. The HEPA filter becomes more efficient as it becomes dirtier with time. Ideal for homes 1000 to 2800 ft². Powerful European Motor delivers 320 CFM (544 m³/hr) of pure air. Up to 58 air changes per day in a 1000 ft² home. Up to 39 air changes per day in a 1500 ft² home. Up to 29 air changes per day in a 2000 ft² home. Up to 23 air changes per day in a 2500 ft² home. Measures 16.25 x 12.75 x 20.125 inches. Weighs 38 lbs (17.2 kg). European Variable Speed Motor – Model FSHEPADM400VS. 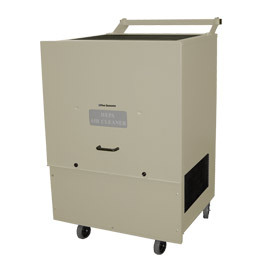 The Mobile True HEPA Air Cleaner & VOC Filter is ideal for commercial applications such as animal shelters and veterinary clinics, cafeterias, food preparation areas, day care centers, hair and nail salons, hotels, health care facilities, medical and dental labs, nursing homes, offices, portable classrooms, print shops, recreation and fitness centers, and restoration applications where there has been flooding or sewer backup damage. It is equipped with rubber castors to easily maneuver from room to room. Long-life, 99.97% True HEPA Filter removes particles 0.3 micron (1/84,000 of an inch) and larger on the first pass of air. The HEPA filter becomes more efficient as it becomes dirtier with time. Contains 188 ft² (17.5 m²) of material. Carbon VOC (Volatile Organic Compound) Filter removes additional unpleasant odors and gases. Ideal for areas ranging from 500 to 1500 ft². Powerful European Dual-Speed Motor delivers 360/600 CFM (612/1020 m³/hr) of pure air. Up to 58 air changes per day in a 500 ft² area. Up to 39 air changes per day in a 1000 ft² area. Up to 29 air changes per day in a 1500 ft² area. 10 Foot Plug-in Power Cord for easy electrical connection. Large Handle & Swivel Rubber Castors for easy maneuvering. Plastic Intake & Exhaust Grills are easy to wipe clean. Heavy gauge steel cabinet and powder-coat paint finish for corrosion resistance and durability. Measures 21.5 x 20.5 x 31.5 inches. Carbon/Potassium Permanganate VOC Filter (optional upgrade) removes heavy-duty odors and fumes such as formaldehyde, heptane, tetrachloroethylene, toluene, etc. that are off-gased from carpets, cabinets, furniture, paints, pesticides, personal care products, cleaners, etc.